Do Hand-Reared Wolves get Attached to their Humans? Researchers test the bond between captive wolf pups and the humans who rear them. We all think our dogs form attachments to us, but previous studies with wolf pups have suggested they don’t attach to their caregiver in the same way. While a 16-week old puppy is already attached to its owner, scientists found the same is not true of a 16-week old wolf. However, the way the wolf pup is raised and the age of testing may have an effect. New research by Nathaniel Hall (University of Florida) et al investigates. The results show wolf pups can form attachments to humans after all. Ten wolf pups from two litters took part in the study (although one pup was ill and not able to take part in all of the tests). From the age of 10 days old, the wolves were raised by two humans who were with them round the clock until 1.5 – 2 months. After this, the caregivers were present 16 hours a day. The research took place at Wolf Park in Battle Ground, Indiana. In children, attachment is tested by the Strange Situation, a set protocol that includes episodes of presence and absence by the caregiver and a stranger. Previous research has used this method on dogs (e.g. Rehn et al 2014; Gácsi et al 2013). The wolf pups were tested using a modified version of this that took account of order effects. They were tested at 3, 5 and 7 weeks of age, using the same caregiver but a different stranger each time. As part of the wolves’ socialization, they were regularly introduced to new people and to different environments, so it is not surprising they did not find being in a new room in the presence of a stranger threatening. This contrasts to studies with young children, in which the absence of the caregiver is generally experienced as threatening. However, this latter effect was only observed in one order of the Strange Situation, when the caregiver returned after the pup had been alone in the room; in the alternate order, this effect wasn’t found, probably because the pup had already had a chance to re-unite with the owner before Episode 6 began. The results show the wolf pups do seem to show something that could be called attachment. However, the sample is small, and the authors caution that the age of the pups, the way they are raised (including the amount of time spent with their two caregivers), socialization, and the way the caregivers behave towards the pups could all have affected the results. So what does this tell us about domestication? The results cast doubt on the idea that dogs are unique in their ability to form attachments to humans. Further research is needed to get a better understanding of what is the effect of genetics and what is the effect of early socialization and rearing. This paper finds that, contrary to many expectations, a non-domesticated animal can form an attachment to the human that raises it. The fact that it was only apparent after a short period of isolation, and not in the presence of a stranger, suggests differences between wolves and dogs that warrant further investigation. The paper is open access if you would like to read the full text. How do hand-reared wolves and dogs interact with humans? Do dogs find their owner’s presence supportive when a threatening stranger comes near? This study of the wolf pups being raised by two humans relate to Charles Darwin and the study of animal intelligence. In this study, 10 wolf pups were raised by two humans around the clock from 1 and half months to 2 months, and then after that the caregivers were only present 16 hours of the day. During this study, the pups were introduced to strangers as well as the caregivers. The pups quickly attached to the caregivers faster than to the strangers. 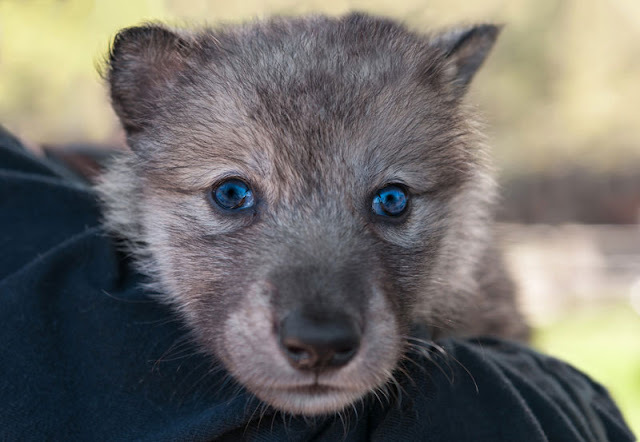 This connects to Darwin's study because the wolf pups realized that the caregivers were capable of giving them constant care and attention that they desired. This shows the animals to be more intelligent than we thought. How Can We Improve Working Dog Programs? Do Dogs Prefer Petting or Praise? Does It Matter What Age You Neuter Your Kitten?